SiliconeThumb Bands are great small reminders for many things. You choose the message that bets fits your needs. Thumb Bands from Silicone are great for small reminders for people. Don't txt and drive, She Loves Me, He Loves me, BFF, or any other custom small message that meets your needs can be debossed into the bands. 67mm x 8mm x 2mm is just the right size for most people, but other sizes are available. 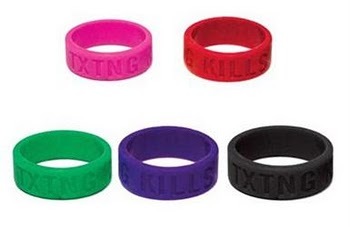 The letters can be color filled just like the wristbands. The smallest quantity we offer is 250 bands. Delivery in approximately 2 weeks from approval of proof. If you have any questions, we are happy to help. Just call us at 253 841 4057.